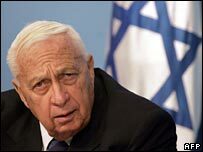 Israeli Prime Minister Ariel Sharon and Labour leader Amir Peretz have agreed to hold elections early next year, officials from both sides say. Mr Sharon and Mr Peretz met on Thursday for the first time since Mr Peretz' surprise leadership win last week. After the talks, Mr Peretz said early elections will be held between the end of February and the end of March. Mr Peretz has pledged to pull his party out of Mr Sharon's coalition, which it has propped up since January. The 53-year-old trade union federation leader told reporters a precise date would be set by Monday. Elections in Israel had not been due until November. Mr Sharon himself is due to face a contest for the leadership of the Likud party in April 2006. Mr Peretz said: "I'm letting him [Sharon] choose a date in that period between the end of February and the end of March and whatever date he chooses is acceptable to me, the earlier the better. "[Sharon] was adamant that we need to go to elections as soon as possible." In an interview with Israel's Yediot Ahronot newspaper on Thursday, Mr Sharon said he favoured elections in February. "Snap elections. Not in May, not in March. If possible, we'll go to the people already in February," he was quoted as saying. Mr Sharon told the newspaper: "As soon as it became clear that the existing political framework was falling apart, I came to the conclusion that the best thing for the country is to hold new elections as soon as possible." Reuters news agency quoted Israel Army Radio as saying the prime minister would choose to call elections on 28 February. The newspaper quoted the prime minister as saying he did not want the peace process with the Palestinians to suffer as a result of a prolonged political wrangling. "Instant elections will prevent diplomatic stalemate. We must ensure that 2006 does not become a lost year with regard to the peace process and the effort to reach an arrangement with the Palestinians." he said. Mr Peretz caused political upheaval by ousting veteran leader Shimon Peres and announcing his intention to pull Labour out of the coalition head by Mr Sharon's Likud party. Moroccan-born Mr Peretz has pledged to shake up Israel's social welfare system and restart negotiations with the Palestinians.